Built as a battleship by Chatham Dockyard, Chatham for the Royal Navy. 08 January 1900 laid down. Displacement 13,270 ton standard, 14,900 ton full load, dim. 132 x 23.01 x 7.85m. (draught). Powered by two sets 4-cyl. vertical inverted triple expansion steam engines, 18.000 ihp, twin shafts, speed 19 knots. Bunker capacity maximum 2,000 tons coal. Range by a speed of 10 knots, 7,200 mile. Armament: 4 – 12 inch Mk IX guns, 12 – 6 inch Mk VII guns, 10 – 12 pdr., 6 – 3 pdr. and 2 Machine Guns. 4 – 18 inch torpedo tubes. HMS ALBEMARLE was a pre-dreadnought Duncan-class battleship of the Royal Navy, named after George Monck, 1st Duke of Albemarle. She was amongst the fastest battleships of her time when she was commissioned, but she became superseded by the new dreadnoughts which began entering service from 1906. Despite this, she served with the Grand Fleet on the Northern Patrol during the early stages of World War I. She was dispatched to Murmansk in Russia for guard and icebreaking duties for most of 1916. On her return to England, she underwent a refit and was in reserve for the remainder of the war. Decommissioned in April 1919, she was scrapped in 1920. HMS ALBEMARLE was laid down on 1 January 1900 at Chatham Dockyard, and launched on 5 March 1901, when Lady Kennedy, wife of Admiral Sir William Kennedy, Commander-in-Chief of the Nore, performed the christening. 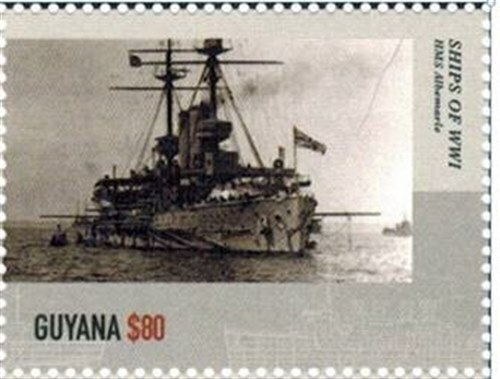 She was completed in November 1903. ALBEMARLE and her five sisters of the Duncan-class were ordered in response to large French and Russian building programmes, including an emphasis on fast battleships in the Russian programme; they were designed as smaller, more lightly armored, and faster versions of the preceding Formidable class. As it turned out, the Russian ships were not as heavily armed as initially feared, and the Duncans proved to be quite superior in their balance of speed, firepower, and protection. Although they were designed before the ships of the London subclass of the Formidable class, the first two Londons were laid down before the first Duncan. The armour layout was similar to that of London, with reduced thickness in the barbettes and belt. ALBEMARLE and her sisters had machinery of 3,000 more indicated horsepower than the Formidables and Londons and were the first British battleships with 4-cylinder triple-expansion engines. They also had a modified hull form to improve speed. ALBEMARLE and her sister ships had a reputation as good steamers, with a designed speed of 19 knots (35 km/h) and an operational speed of 18 knots (33 km/h), good steering at all speeds, and an easy roll. They were the fastest battleships in the Royal Navy when completed, and the fastest predreadnoughts ever built other than the Swiftsure-class HMS SWIFTSURE and HMS TRIUMPH. ALBEMARLE herself was viewed as the best steamer under service conditions among the Duncans. ALBEMARLE and her sisters had the same armament as and a smaller displacement than the Formidables and Londons. 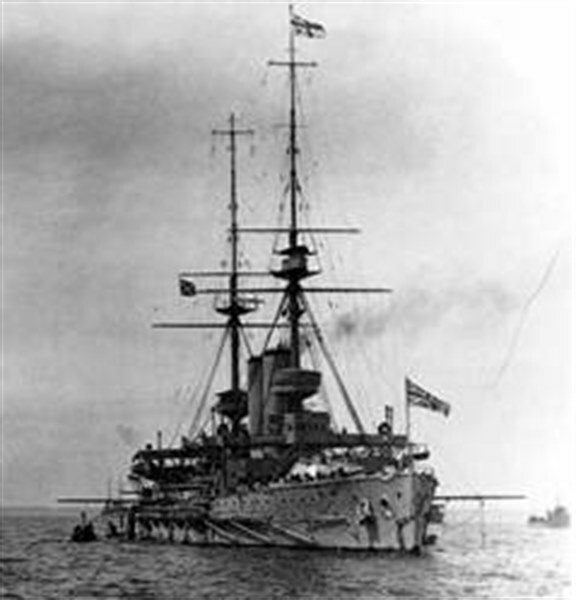 Like all predreadnoughts, ALBEMARLE was outclassed by the dreadnought battleships that began to appear in 1906, but she nonetheless continued to perform front-line duties up through the early part of World War I.
HMS ALBEMARLE commissioned at Chatham Dockyard on 12 November 1903 for service as Flag extra, Rear Admiral, in the Mediterranean Fleet. In February 1905 she transferred to the Channel Fleet to serve as 2nd Flagship. She transferred to the Atlantic Fleet on 31 January 1907, serving as 2nd Flagship there as well. Under Captain Robert Falcon Scott 's command, she collided with the battleship HMS COMMONWEALTH on 11 February 1907, suffering minor bow damage. She became Flagship, Rear Admiral, at Gibraltar in January 1909[ and underwent a refit at Malta from May through August 1909. Her Atlantic Fleet service ended in February 1910. On 25 February 1910, ALBEMARLE recommissioned for service in the 3rd Division, Home Fleet, at Portsmouth. She paid off at Portsmouth Dockyard for a refit on 30 October 1911; the refit lasted from January to December 1912. Her refit complete, ALBEMARLE recommissioned at Portsmouth to serve in the 4th Battle Squadron in the First Fleet there. On 15 May 1913, she was reduced to a nucleus crew and assigned to the 6th Battle Squadron, Second Fleet, to serve as a gunnery training ship. When World War I began in August 1914, plans originally called for ALBEMARLE and battleships AGAMEMNON, CORNWALLIS, DUNCAN, EXMOUTH, RUSSELL and VENGEANCE to form the 6th Battle Squadron and serve in the Channel Fleet, where it was to patrol the English Channel and cover the movement of the British Expeditionary Force to France. However, plans also existed for the 6th Battle Squadron to be assigned to the Grand Fleet, and, when the war began, the Commander-in-Chief, Grand Fleet, Admiral Sir John Jellicoe, requested that ALBEMARLE and her four surviving sister ships of the Duncan class (CORNWALLIS, DUNCAN, EXMOUTH and RUSSELL) be assigned to the 3rd Battle Squadron in the Grand Fleet for patrol duties to make up for the Grand Fleet's shortage of cruisers. Accordingly, the 6th Battle Squadron was abolished temporarily, and ALBEMARLE joined the 3rd Battle Squadron at Scapa Flow on 8 August 1914, and worked with Grand Fleet cruisers on the Northern Patrol. ALBEMARLE and her four Duncan-class sisters, as well as the battleships of the King Edward VII class, temporarily were transferred to the Channel Fleet on 2 November 1914 to reinforce that fleet in the face of German Navy activity in the Channel Fleet's area. On 13 November 1914, the King Edward VII-class ships returned to the Grand Fleet, but ALBEMARLE and the other Duncans stayed in the Channel Fleet, where they reconstituted the 6th Battle Squadron on 14 November 1914. This squadron was given a mission of bombarding German submarine bases on the coast of Belgium, and was based at Portland, although it transferred to Dover immediately on 14 November 1914. However, due a lack of antisubmarine defenses at Dover, the squadron returned to Portland on 19 November 1914. The 6th Battle Squadron returned to Dover in December 1914, then transferred to Sheerness on 30 December 1914 to relieve the 5th Battle Squadron there in guarding against a German invasion of the United Kingdom. Between January and May 1915, the 6th Battle Squadron was dispersed. ALBEMARLE left the squadron in April 1915 and rejoined the 3rd Battle Squadron in the Grand Fleet. She underwent a refit at Chatham Dockyard in October 1915. In November 1915, ALBEMARLE was ordered to move to the Mediterranean with a division of the 3rd Battle Squadron that also included the battleships HIBERNIA (the flagship), ZEALANDIA, and RUSSELL. The ships left Scapa Flow on 6 November 1915, but encountered extremely heavy weather that night in the Pentland Firth. ALBEMARLE, heavily loaded with spare ammunition, suffered severe damage early on 7 November when two large waves struck her in rapid succession, wrecking her forebridge and chart house, shifting the roof of her conning tower, and flooding her forward main gun turret, mess decks, and flats. An officer and rating were washed overboard and lost, another rating was killed, and three officers and 16 ratings suffered serious injuries; two of the injured ratings later died. In an 8 November 1915 letter to First Sea Lord Admiral Henry B. Jackson, Commander-in-Chief of the Grand Fleet Admiral John R. Jellicoe described what had happened, saying that ALBEMARLE had been making 16 knots when water from the two waves had risen as high as the bottom of her lower foretop, filling the foretop with water, sweeping her forward deck clear and smashing the forebridge, most of which was found in pieces on her upper deck. Accompanied by ZEALANDIA and HIBERNIA which assisted her in proceeding for repairs to Scapa Flow, where she arrived later on 7 November and transferred 24 injured ratings on stretchers and three officers to the hospital ship PLASSEY for further treatment. When her repairs were complete in December 1915, ALBEMARLE was ordered to rejoin the Grand Fleet. She thus became the only Duncan-class ship (other than MONTAGU, which had been wrecked before the war) with no wartime Mediterranean service. In January 1916, ALBEMARLE was detached from the Grand Fleet to serve in North Russia at Murmansk as guard ship and as an icebreaker in the approaches to Arkhangelsk. At Murmansk, she also served as flagship of Senior Naval Officer, Murmansk. ALBEMARLE returned to the United Kingdom in September 1916, paying off at Portsmouth to provide crews for antisubmarine vessels. She began a refit at Liverpool in October 1916, and upon its completion in March 1917 she went into reserve at Devonport Dockyard; her main-deck casemate 6-inch (152-mm) guns were removed and replaced with four 6-inch (152-mm) guns on her battery deck between September 1916 and May 1917. ALBEMARLE was in reserve until April 1919, used as an overflow accommodation ship for the naval barracks at Devonport, and was attached to the Gunnery School in 1919. 1919. She was sold for scrapping to Cohen Shipbeaking Company on 19 November 1919 and arrived at Swansea for scrapping in April 1920. Guyana 2015 $80 sg?, scott?